Following the words of Bradley Wiggins on helmets after he grabbed gold for Britain at the London 2012 Olympics, Lids for Kids has called to make helmets compulsory for children who cycle. Lids for Kids aims to educate children on the importance of wearing a helmet so that it becomes ‘the norm’ as they grow older. In addition the campaign plans to change the law to make it compulsory for children to wear helmets. Fletchers Solicitors is running a consumer campaign to push for the law change and also to encourage more action from individual communities when it comes to the safety of their own children on the roads. Lids for Kids confirmed to BikeBiz that it is only targeting children on cycles, and not those on skateboards, scooters or any similar products. Fletchers will work with brain injury association Headway to produce online materials aimed at schools to spread the ‘Lids for Kids’ message. It will focus on generating positive action at local level, encouraging each school to sign up as a badge of commitment to child safety and community action. Jacob Roberts, five time British BMX Champion and Team GB BMX Cyclist, is supporting Fletchers’ campaign. Roberts said: "All it takes is one crash or fall from a bicycle to change your life forever. Cycling helmets are one way of helping to prevent head injuries. For a BMX racer the helmet is the most essential piece of protection as crashes are hard and frequent. I’ve had to replace numerous helmets following crashes where my head has hit the ground hard. The helmets have been destroyed on impact, an indication of how hard my head has hit the ground but thankfully I’ve escaped head injuries with no more than the occasional knock-out." Brain injury charity Headway and British Superbike (BSB) champion Tommy Hill is also backing Fletchers’ campaign. Another Lids for Kids backer is 22-year old Sinead King. King is still receiving physiotherapy for a brain injury she sustained as a child when she fell a few feet to the ground falling off her Barbie bike age six. She spent the summer of 2008 in plaster and in a wheelchair following an operation to lengthen her Achilles tendons, which had seized as a result of her left-sided weakness. Lids for Kids campaign says evidence shows that children are less likely to suffer brain injuries if wearing a helmet. The Cochrane Review states that helmets provide a 63 to 88 per cent reduction in the risk of head, brain and severe brain injury for all ages of bicyclists. Ed Fletcher said: "This is an extremely robust and important study which proves that we need to look after our children to avoid another sad tale like Sinaed’s.
" The Government has done its own research into whether helmets are effective. It commissioned the independent Transport Research Laboratory to look at all the evidence available. In November 2009, it published its findings, which showed helmets – if worn correctly – do indeed offer protection against head and brain injury." 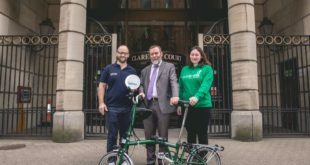 Headway chief exec Peter McCabe said: “The evidence is clear: cycle helmets can save lives and help prevent lifelong disability. We believe all cyclists should wear helmets, particularly vulnerable road users such as children.